Drums are the pulse of any musical ensemble, and commanding the rhythm of music is an empowering experience. As a drummer, you get to be in command of a song’s speed and intensity and contribute to the making of music in a powerful way. We teach private, in-home drum lessons to local Arlington students of all ages and all skill levels. Our instructors are passionate about the drums and have real gigging backgrounds that allow them to teach real-world, practical skills like stage presence, getting into “the flow” with other musicians, and how to genuinely have fun with the instrument. If your child is interested in playing the drums, it’s an excellent way to begin a journey with music. 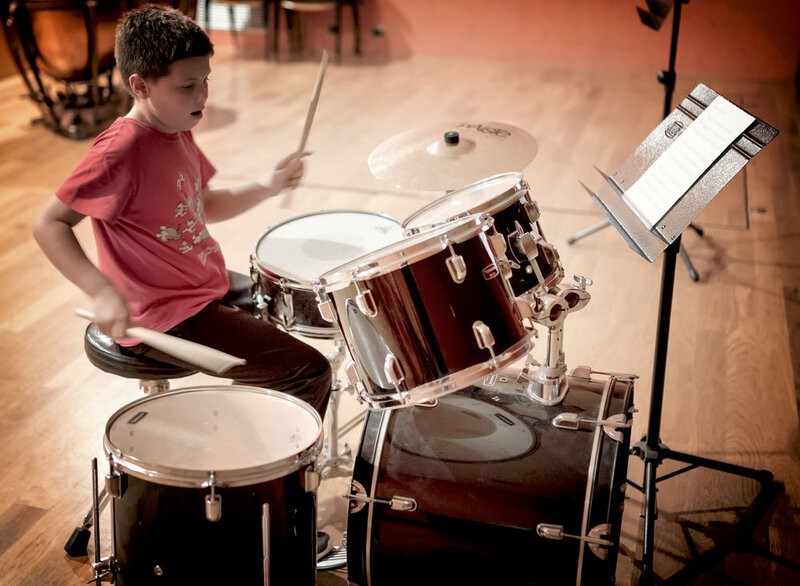 We teach the drums in a way that develops the drummer as an overall musician. By teaching them how to read music and how to work together with other musicians, we give them the skills they need to integrate seamlessly with any band, orchestra, or group they might stumble upon throughout their career. We do all of this in a way that removes all the inconvenience for parents and busy families. By teaching in our students’ homes and having our instructors do all the driving, we remove many of the barriers of one-on-one lessons for most families. Not only that, but we offer every interested student a risk-free trial lesson. We’ll come to your home and give your child their first lesson. If they have anything short of a fun and engaging experience, you don’t pay a dime! Our instructors can work with students at any skill level. Whether picking up the sticks for the very first time or trying to refine more advanced skills, we can help them become a better drummer. Maybe your child has been playing for a while but wants to work with a coach who can refine their overall music skills to help them integrate with a band down the road. Maybe they are just looking for other passionate musicians their age to play with. A core part of our curriculum is bringing our students together to practice and perform with others. For most of the team here at Arts & Minds, our passion for music started when we began playing with others. We aim to give our students that same experience and foster a lifelong relationship with music. From learning basic rudiments for the first time to polishing skills like stick speed and control, rhythm and volume control, and more, there’s always more to learn. No matter your child’s skill level, we can help develop their abilities while giving them a five-star experience with the instrument that leads to a lifetime of enjoyment. Drumming is incredibly rewarding. It’s a feeling that can be experienced the first time you pick up sticks, and only gets better the further along you progress. At first, it comes from pure feedback. You use the instrument to make loud, powerful sounds. It’s just a fun thing to do from the get-go. As you refine those skills, it turns into something else. It becomes an incredibly stimulating mental and physical challenge. When you play with a group, your mastery over the instrument is laying a foundation for the music you’re collectively creating. You’re the timekeeper for the group. They rely on you to keep that time consistent. Nailing that is so rewarding, not just for the drummer, but the whole band. You pour your energy and expertise in, and you get something with real value back out. It’s a feeling unlike any other. We aim to teach music in a way that develops the whole child. Drums are an excellent vessel for this development because they require a number of essential life skills. For one, drummers must be able to play dynamically, meaning both soft and loud. This takes confidence, and the very act of learning dynamic drumming and stick control requires patience, discipline, and critical thinking skills. In fact, a recent study shows that musicians, particularly drummers, have better attention spans and cognitive function because of their ability to create and maintain precise rhythms. Students need to be able to break down complex tasks into manageable parts. It’s a mindset that applies to many of life’s challenges, and the drums present an opportunity to master it in a way that is fun and stimulating. Arts & Minds offers a top-tier music education while making the whole process fun. We can provide this largely because we have a team of some of the most dedicated and passionate instructors the industry offers. Our instructors are accomplished musicians who can leverage their experience in a way that captures the fun and energetic character of the instrument. We aim to give our students an experience that helps cultivate a genuine passion for their instrument. To accomplish this, they have to have fun. With a modern take on teaching music and a team of just the right people to get the job done, we’ve developed a program that develops critical skills, creates a foundation for building into more advanced concepts, and keeps your child smiling the whole time. Students can get bogged down with rudiments, exercises, and music reading. These are all essential skills for becoming a better drummer and musician overall. By approaching these fundamentals in an engaging way and allowing some time for just having fun, we achieve the best of both worlds. 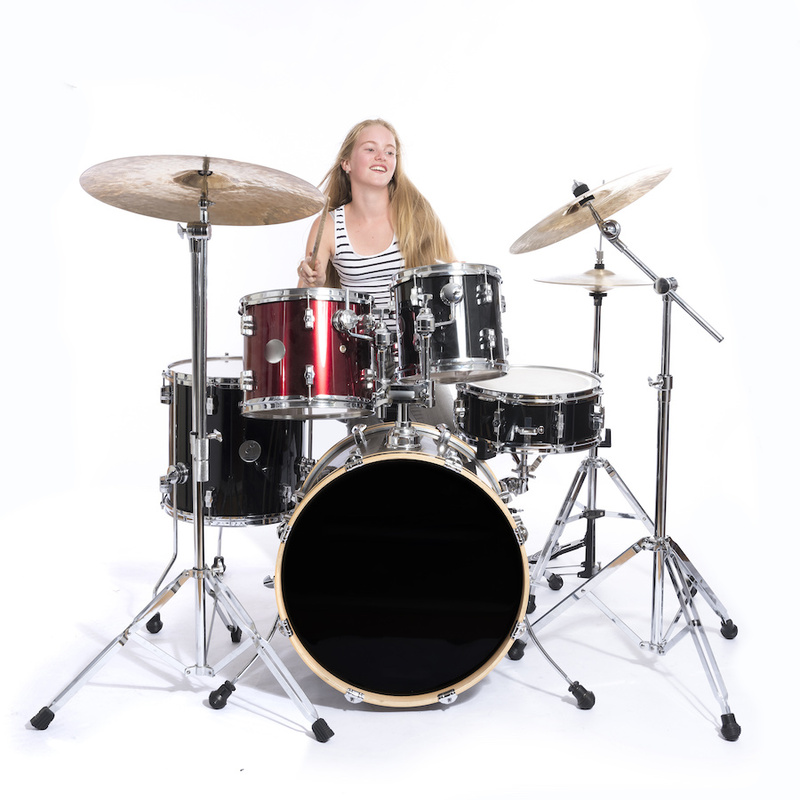 With any drum set, acoustic or electric, we can get your child’s journey with the drums started today. If you are wondering what equipment is essential for a beginning drummer, or which kind of kit is most appropriate for your household, don’t hesitate to give us a call. Our expert drummers will be happy to provide guidance on what products are out there and how you can get started with your needs and budget. You don’t even need a kit to get started! Our teachers will bring the equipment they need for the first few lessons until you make a decision. We’ll send one of our dedicated drum instructors to your home to provide a lesson at no risk to you. All they need is the will to play the drums, we’ll take care of the rest. If your child doesn’t have an awesome experience, you don’t pay a dime.